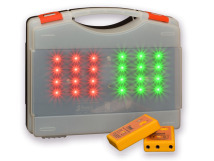 Electronic target especially designed for fencing training. 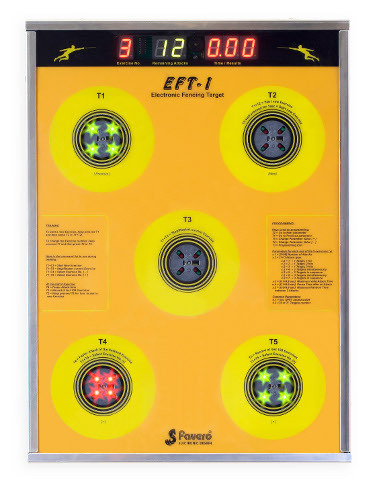 • The EFT-1 has 5 targets, each with a red light at the center that lights up to signal when it should be attacked and turns green when hit. • Completely programmable by the fencing master, who can prepare 9 different exercises, setting various parameters for each one. • Students can easily choose the best exercises for their individual needs, level, and specific areas of improvement. • The student sees the response time of every hit and the average time for the exercise when it is completed. This is helpful for the fencing master to evaluate the student’s level and decide when to pass on to more difficult exercises. • Students are highly engaged and have fun competing with each other to test their skills. They can also view the record time for each type of exercise for the last 100 completed, creating a goal to be reached. • Fencing halls can considerably increase their number of students by adding a few electronic targets: the challenging pace of the targets engages students while motivating them to reach specific objectives. • The display showing the information is protected from hits. It shows: 1) the number of the current exercise; 2) the number of attacks that need to be made; 3) the response time of each attack in seconds, tenths, and hundredths of seconds; 4) the overall result for the exercise; 5) the best attack time for the completed exercise; 6) the record result of the last 100 exercises for each type of exercise. • A tough front panel made of multiple layers of polycarbonate and PVC. The tip of the weapon does not slide. • A shock absorbing system prevents hits from deteriorating the weapon tips. • The stainless steel frame around the container means there are no painted parts to get ruined by hits. • There are no keyboards, preventing malfunctions due to blows from weapons. The commands and programming functions are all given through the targets. • The special wall mounts that come with the target make it possible in a matter of seconds to adjust the EFT-1 to students of any height by positioning it at 8 cm intervals to one of the 6 available heights. • The valid target area changes depending on the speed of the impact, and the peripheral area around the target requires greater impact force than the part in the center. This means that slower actions, like those performed from a resting position, require greater precision, while quicker actions, such as those prepared by footwork, are allowed more tolerance. • A sound is emitted when the target is hit (can be deactivated). • Power supply: 12V DC/AC 300 mA, using the adapter that comes shipped with the target. It can also be powered using an optional battery (art.828). Type 7. Three targets one after the other, to be hit in sequence. • Number of attacks, programmable from 3 to 99. • Attack time limit. Sets the time limit within which the attack must be completed. • Pause time after an attack. The time allowed to the student to get back into position in order to prepare for the next attack. • Maximum random delay. Sets the random delay of the targets so that the fencer cannot predict when they will light up, helping to develop quick reflexes. Art.973 Floor mount stand for the EFT-1 electronic fencing target[foto]. Useful when the EFT-1 mounting brackets cannot be attached to the wall or when the target is being used in temporary places for demonstrations or training. 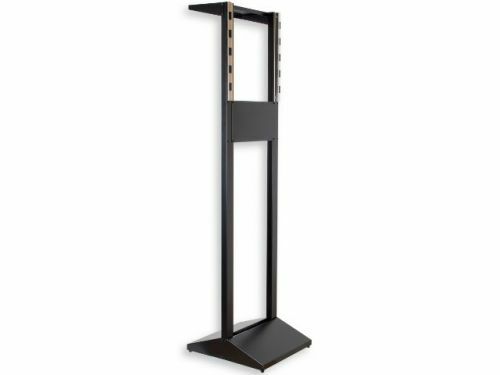 The stand must in any case be placed against a wall to prevent the target from being moved or tipped over from the impact of hits. Handy power supply for the EFT-1 electronic fencing target when no mains power is available. Typical battery life is 55 hours. 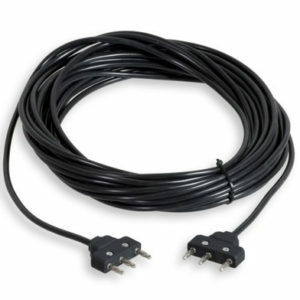 The battery cable is only 35 cm so if it is placed on the ground an extension cable (art.828-5) is also required.